In general, a visual identity consists of your logo, colours, typography, imagery style, and textures. While it’s often mislabeled as “brand”, your visual identity is actually an outward expression of a bigger strategy. Think of it as your brand’s style. If your brand was a person, the visual identity is what type of clothes they wear, how they cut and colour their hair, and what style of makeup they like. Are you more likely to see them in jeans and t-shirts or suits and high heels? The human brain processes images 60,000 times faster than text and 90% of information sent to the brain is visual. Contrary to the aphorism, we *do* judge books (and marketing material) by their covers. Having a professional visual identity gives your audience a window into what they might expect from you, allows you to build trust with your audience, and is an outward expression of what you stand for. 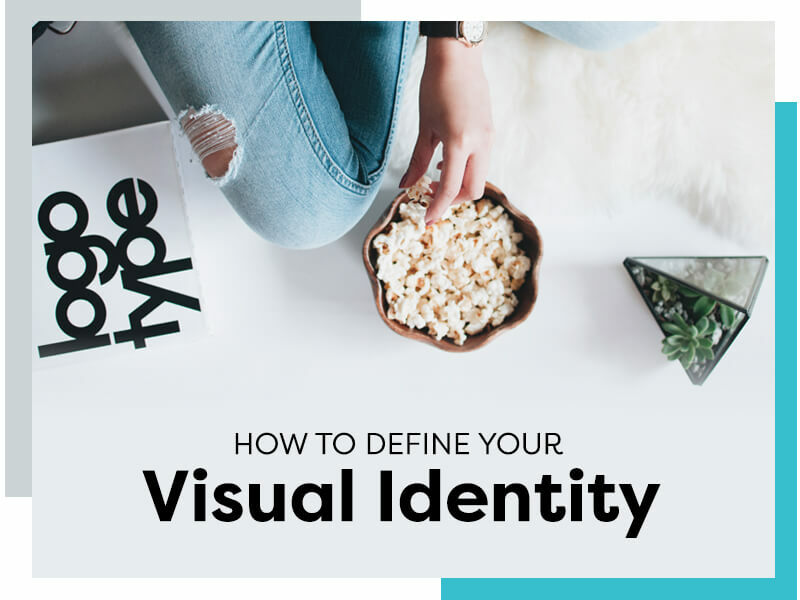 Your visual identity also allows your audience to easily recognize you and to know what content, products, and advertising have been produced by your brand. First, start with brand strategy. Remember that the visual identity is not your brand, it’s an expression of it. This is a very confusing thing for many entrepreneurs as we regularly see people talking about their “rebranding” or “their brand” when they mean a new website or logo. Before you build your identity, figure out what matters to you. What is your brand going to stand for? What do you value? Who are your people and what is important to them? Where are you going to position your brand compared to your competitors? What are your key messages? Once you’ve determined this, create a list of words that describe your brand and how you want people to feel when interacting with you. This is a great opportunity to set yourself apart. For example, if you sell financial advice, you’ll want to look secure and trustworthy but you could also represent yourself as fun and friendly. A wedding photographer who really wants to work with edgy, non-traditional couples, will need a portfolio that represents the type of people they like working with and the shots they want to create. An executive coach who wants to change traditional corporate culture might present themself in jeans and t-shirts. One of the most important things to recognize about a visual identity is it is meant to evolve. Likely, you aren’t wearing the same outfits you loved 15 years ago. Some of you aren’t wearing the same things you wore last year. The same is true of your visual identity. Entrepreneurs tend to agonize over logos, thinking they are stuck with it forever, but you truly aren’t. Companies evolve their logos (and their looks) all the time. The important thing is your visual identity represents you well for where your brand is today. As your brand grows and changes, your identity definitely can and should too. If you’re in the process of creating your brand and visual identity, and you feel like you just can’t see the forest for the trees, I’d love to talk to you. Schedule a call and let’s see if I can help.